The IITA Development and Delivery Office gave an outline of new generation scaling activities and projects that it is implementing to ensure the actualization of the IITA transformation agenda across sub-Saharan Africa. These were highlighted on the opening day of the 2018 P4D Week which took place between 26 and 30 November. There is also the need to improve and adapt the technologies over different iterations and make provision for expansion and scaled-out adoption, as technology will go nowhere without the markets, Dixon elaborated. 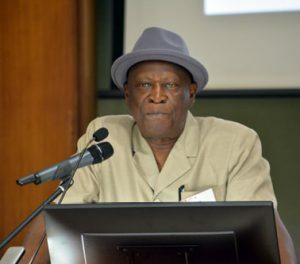 He noted that IITA had in the past delivered over 70% of CGIAR’s impact in sub-Saharan Africa but also called for continued commitment from all because without research and delivery there will never be transformation of African agriculture. In a joint presentation, IITA Principal Investigator, Sustainable Weed Management Technologies for Cassava Systems in Nigeria, Friday Ekeleme and Communication & Knowledge Exchange Expert Godwin Atser spoke on the journey from technology and knowledge generation to scaling out using the cassava weed management project as a case study. They concluded that sustainability is about profit and that the actors in the private sector will only join hands in partnership with R4D organizations like IITA when they see that the technology is profitable, echoing the earlier point made about the necessity of markets to the development, delivery, and sustainable scaling of technologies. In their presentation, Head of IITA Abuja Station, Gbassey Tarawali and Head of IITA Onne Station, Richardson Okechukwu, emphasized the need to align with government initiatives to achieve success in the outscaling of improved technologies and knowledge. They highlighted how multiple CGIAR centers and P4D scientists worked with the Nigerian government and institutions to revolutionize Nigerian agriculture. They concluded that ensuring the buy-in of government and policy makers to technologies will facilitate not only the scaling of these technologies but also the sustainability of the initiatives.